Cigarette caresses and rose petal lips, got a hand on a phone, got a hand on a hip. 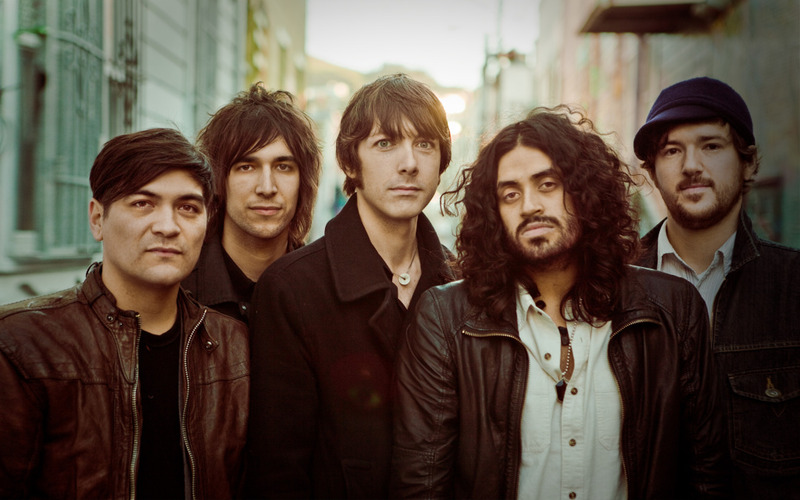 The Soft White Sixties (named after a type of lightbulb) are a five-piece rock and roll band from San Francisco, California that was formed in 2008 by Mexican-American singer/songwriter Octavio Genera. He recruited Joey Bustos on drums, and Ryan Noble on bass/vocals—both of whom were former members of the band Link 80. Soon after, Aaron Eisenberg (a former radio personality) joined as guitarist/keyboardist, as did midwestern-born guitarist/vocalist Josh Cook. They quickly developed a devoted following around Northern California, named as one of San Francisco radio station Live 105's top ten bands in the Bay Area. In early 2011, The Soft White Sixties recorded and released their debut, self-titled EP. It was recorded live at The Hangar in Sacramento in just two days, and was produced by Joe Finocchio and mixed by Andy Freeman. The Soft White Sixties are currently touring and recording. With their shaggy hair-dos, tight jeans, and skinny scarves, The Soft White Sixties have all the makings of an obscure band from the early days of the British Invasion—as if they've just stepped off stage after opening for one of The Rolling Stones' first concerts. Hailing from San Francisco, the five-piece band actually formed in 2008, over half a century after the birth of British blues-rock. Although they haven't released a full-length album yet, their 2011 self-titled EP is a solid starting point that encapsulates the energy of their live performances. Recorded over just two days in a studio in Sacramento, California, it's a five song appetizer of vintage-inspired rock and roll. “When This All Started,” a very fitting title for the EP's opening track, starts at a more leisurely pace before gradually picking up speed. Lead singer Octavio Genera practically begs, “I just want your love/I just need your love!” as Joey Bustos' drumbeat and Aaron Eisenberg's keyboard match the frantic intensity. Coming in just over five minutes in length, “Better Way” is the band's dive bar jukebox jam. It has a slower, bluesy groove that matches the mood of lyrics about bottling up your feelings when you have something you're dying to say. When the rest of the band members join Genera on “better, better way-ay-ay,” it sounds like a group of good buddies providing moral support for that friend who's drinking his sorrows away. “Queen of the Press Club” is an uptempo rocker that's oozing with rock and roll swagger. The song title was inspired by a dive bar in Sacramento called the Press Club, where an old scenester—still clinging onto the past of her socialite heyday—snapped at Genera for putting his coat on her chair. It's built around a memorable guitar riff with fuzzy distortion on the guitars and vocals, and is the type of song that you know would be even greater to see in concert. Ending the EP is “Live in the Evening,” which starts with a fantastic 60s-style keyboard riff that sets the mood for the rest of the boisterously fun song. They could've easily ended the EP with a slower number, but by closing with “Live in the Evening,” the sentiment that comes across is that they want to send you off on a high note, and have as much fun as they're obviously having. In a music climate saturated with introspective and melancholic bedroom pop, The Soft White Sixties will breathe new (albeit vintage-inspired) life back into your music collection.